“I was saddened, I was shocked. I left home and everything was fine that day, I never thought that this [fire] would happen. I can’t even recognize the place,” narrates 16-year-old Heart. I found Heart in a middle of a rubble, hunching over what was left of their home. He was busy clearing their char-filled floor. His family’s house is one of the many that were consumed by the raging fire on February 8, displacing more than 10,000 children and families in Malabon City. Heart’s father works as a messenger. His mother is a housewife who owns a small poultry in and manages a small computer shop to augment the family’s income. None of these investments were left. The fire’s fury left the community barren. It was a little after noontime. The scorching heat was unbearable, the stench of the burning plastics and house-wood was strong, and the broken pipes were bursting with overflowing water. But the urban community people were unmoved by the hot weather. They were keen to rebuild their homes, scavenging on what the fire has left for them, looking for something that may be of use. Despite his family’s losses, Heart is grateful that his family is safe. “I thank the Lord that all of us are in good condition. 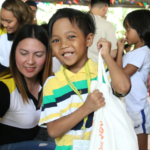 I am also thankful that the people understand our situation and they are willing to help.” Heart is one of the 1,500 World Vision-assisted children in Malabon. 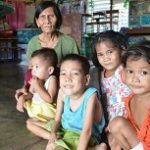 How does World Vision help families prepare for disasters? With rice and sardines as their Noche Buena, 9-year-old John Ernest and his family spend Christmas and New Year at the evacuation center.